NEH on the Road is an exciting program that brings scaled-down versions of NEH-funded exhibitions to mid-sized museums, libraries, schools, and universities, locations around the country. For seven weeks at a time, these places offer exhibitions normally unavailable to local audiences – and thus expand the reach of these interactive displays. Seven exhibitions are currently circulating throughout the country. One of these is “¡Carnaval!,” an exhibit that examines eight communities from around the world where some kind of carnival is an important cultural event. 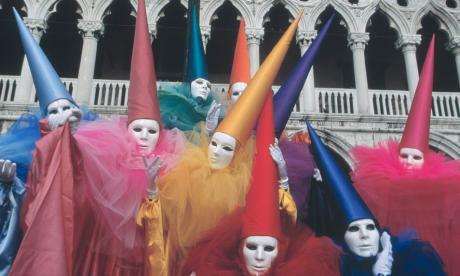 New Orlean’s Mardi Gras is featured, as well as a lesser-known carnival in Laza, Spain. The exhibition includes photographs, video clips, and the gorgeous masks, necklaces, and shoes that feature heavily in the celebrations. “¡Carnaval!” is currently in Moraga, California, until April 14. ¡Carnaval! Courtesy Museum of International Folk Art, Santa Fe, NM. Photo: Shirley and David Rowen. 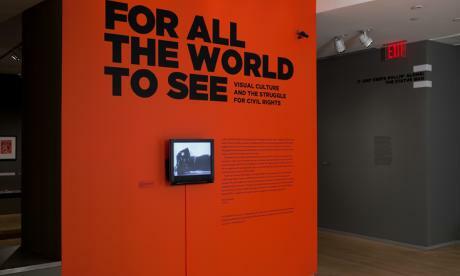 Another exhibit currently on its way to Eau Claire, Wisconsin, is “For All The World to See: Visual Culture and The Struggle for Civil Rights,” which explores how visual culture affected the struggle for racial equality in America during the Civil Rights Movement of the mid-20th century. The exhibit claims photographs of Emmett Till’s murder, for example, changed American perspectives of racism. For All The World To See. The exhibition at the International Center of Photography in New York. Please find the locations for all other current “NEH on the Road” exhibitions below. “Our Lives, Our Stories: America’s Greatest Generation” will be exhibited in Red Cloud, Nebraska, starting on June 16. “The Bison: American Icon,” “Farm Life: A Century of Change for Farm Families and Their Neighbors,” and “House & Home” will all resume their traveling schedules on September 1, 2013. If your community is interested in hosting one of these traveling exhibitions, please take a look at the “NEH on the Road” website or its Facebook.